In 2006, Access Anything teamed up with Adaptive Adventures out of Evergreen, CO and Chicago, IL to bring three sports camps to Steamboat Springs: The Steamboat All Mountain Ski Camp, the Behind the Boat Watersports Camp, and the Stars of Tomorrow Kids Ski Camp. For four years, we helped make these camps among the best in the country for our attendees and fellow adventurers, some of which included our esteemed wounded veterans of the Gulf Wars. We were proud to be a part of the success of these great camps that showcased Steamboat Springs as a top accessible destination in the world. In 2010, a new non-profit organization, Steamboat Adaptive Recreational Sports (STARS) took over these camps for us, and hired on Craig as their Program Director. 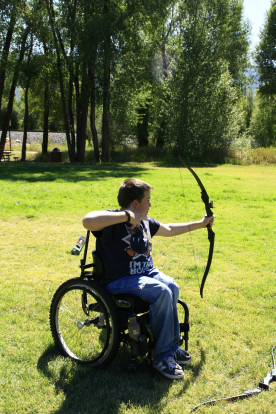 Within the next few years, these three camps grew to four, and five, and six... and STARS now has full year-round programming for all ages of adventurers with disabilities, and what an asset this is to Steamboat Springs. Please see the STARS and Adaptive Adventures websites for camps if you are interested in traveling to Steamboat or Colorado for adventure! For images and videos on these various camps, see the links below. For press on them, please see our In the News page.